Home › Residential events › Musashi634 celebrates Tanabata! 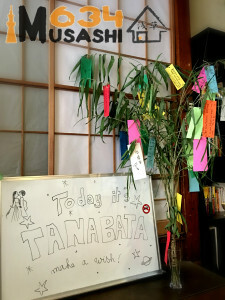 Tanabata or 七夕 is a festival in Japan every July 7. It is celebrated by writing wishes or poetry on a 短冊(tanzaku) paper and hung on a bamboo tree. It originated from China and is said to be about the meeting of the deities Orihime and Hikoboshi (represented by stars Vega and Altair) who were separated by the Milky way and are allowed to meet only once in a year on the seventh day of the seventh lunar month. In line to this occasion, lead by Musashi634 residents Chloe and Leo, our sharehouse joined in the tradition and put up a tree in the lounge. Almost everyone came after work and hung their messages of aspirations and gratitude. Thank you Chloe and Leo for exerting the effort of going around Asakusa to bring home a bamboo tree.